From January 1 through February 28, I’ve been dreaming of warm weather and cold cocktails and now that March is here, I can almost smell the peonies (through the snow we had a few days ago)! 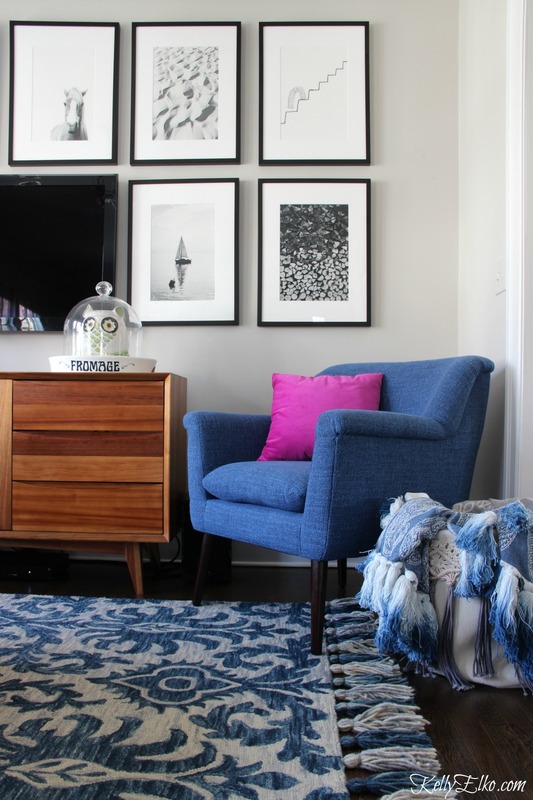 So I’m kicking off the fur throws and turning off the fireplace because I am ready for spring and I’m starting by transitioning from winter to this glorious season with a spring family room refresh! 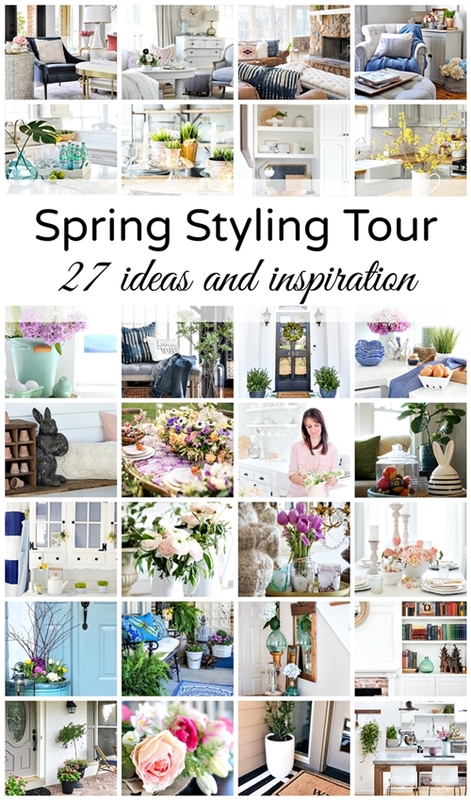 My friend Jennifer asked me to join her and some other amazing bloggers (see them all at the end of this post) to share our spring room makeovers and show how we transitioned them from winter to spring. I’m all about a good before and after so of course I said bring it on! 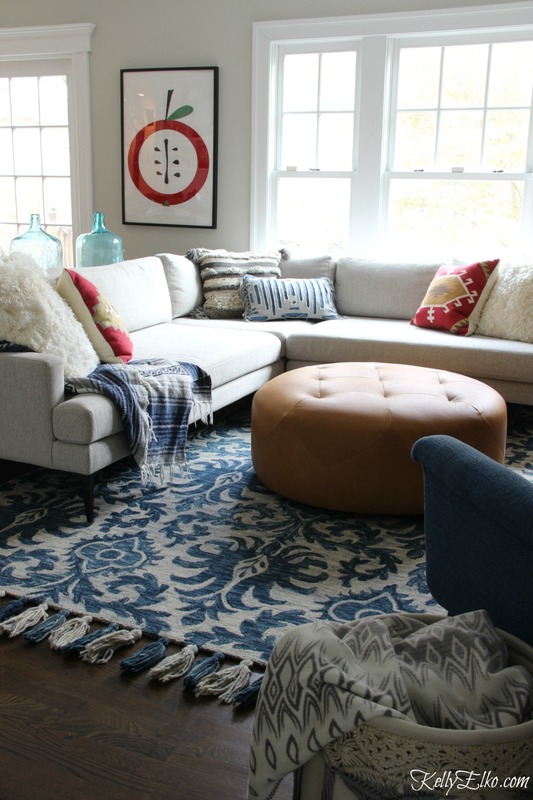 Like a favorite pair of blue jeans that goes with everything, I consider blue a neutral and this Loloi rug with it’s fun giant tassels makes the room! With the basics in place, it’s easy to swap out accessories. 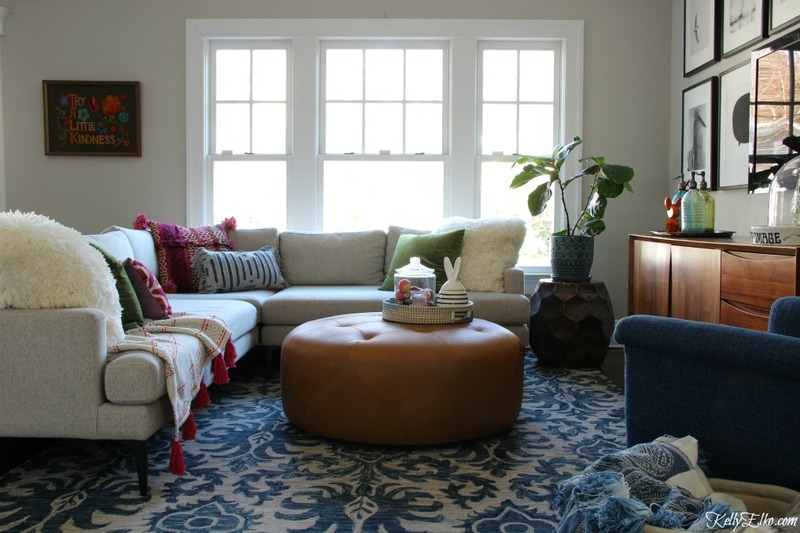 It’s amazing what pillows, throws and accessories can do to transform the look of a room and they can turn my neutral sectional sofa into a showstopper. Don’t be afraid to mix colors – I raided my pillow and throw stash and decided on replacing the winter reds with pink and green. I’ve had my fiddle leaf fig for almost a year now and after a brief moment where I thought I may lose her, I managed to revive her and now she’s thriving. Read my Fiddle Leaf Fig care tips if you’re thinking of getting one. 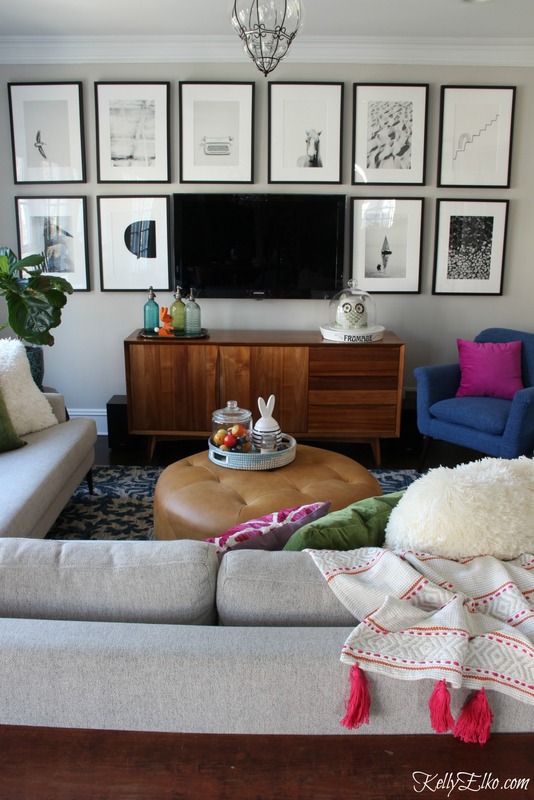 I am still madly in love with my gallery wall – if you want more details and source info, go to this post. 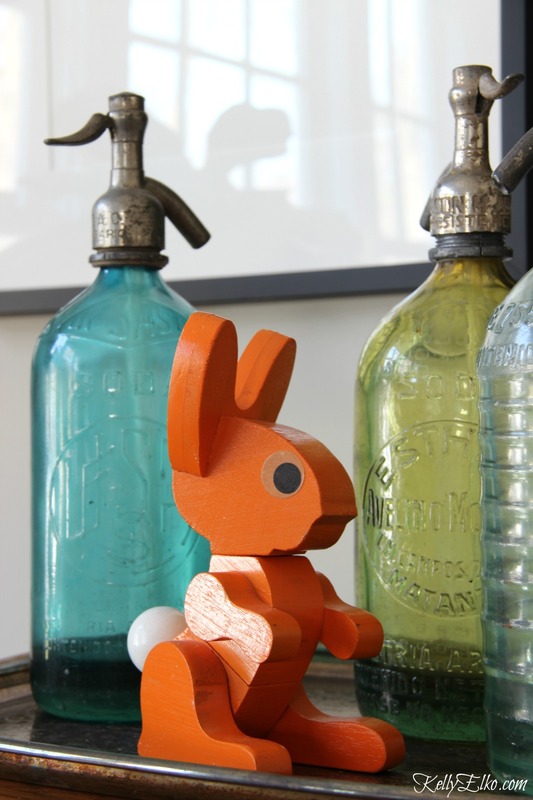 This little orange fella is actually a vintage puzzle hanging out with my vintage seltzer bottles. 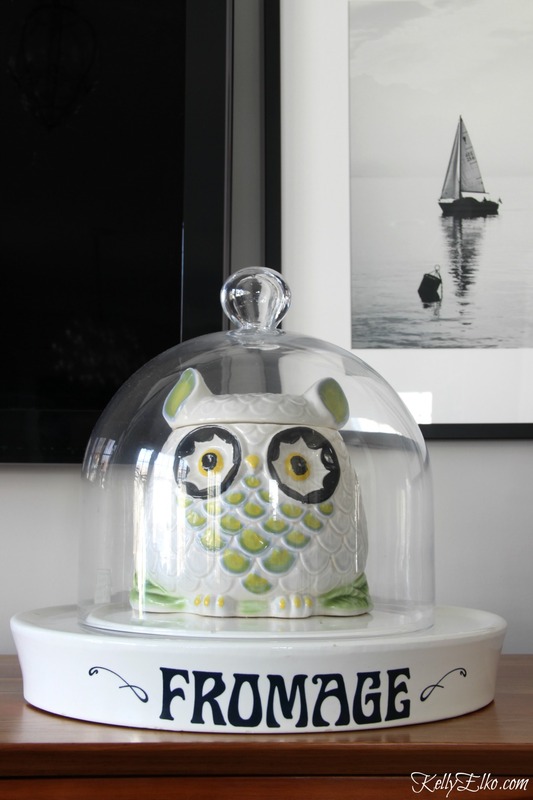 Because using cookie jars for cookies is so 2017. It’s may be small but it’s mighty. All that’s missing from this room is a jar of Cadbury eggs! Come back tomorrow to see my spring mantel. the orange bunny is so fun! loving the touches of fuschia as well! Poor bunny only has one eye! Where oh where did you get the fromage cloche? I’ve been looking for one for years! I found it at a thrift store for $3! I love all your decor for spring and i am so ready. We have been having some nice days and still having some freezing nights, so anxious for my flowers to start blooming. Have a great week. Color queen you are over here Kelly! 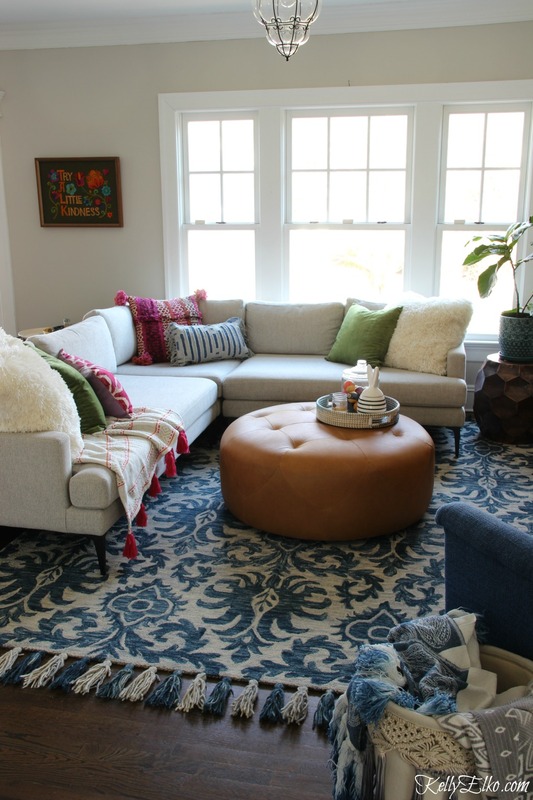 Kelly, your rug with the tassels is amazing! I love your fun sense of style. 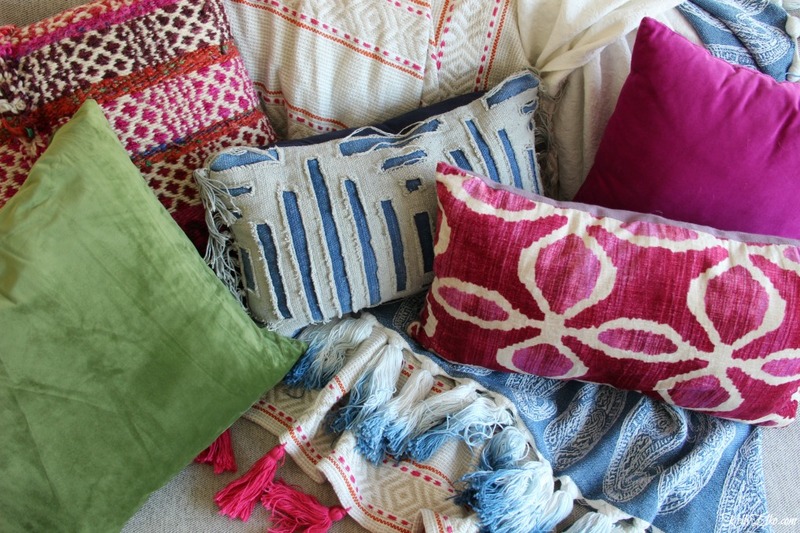 I’m jealous of your pillow collection! Thanks so much for being on the tour. I love your family room, it’s gorgeous. Looks so cozy and inviting. Thank you for sharing it. Hi Kelly, happy almost Spring! Your house looks great, as always. 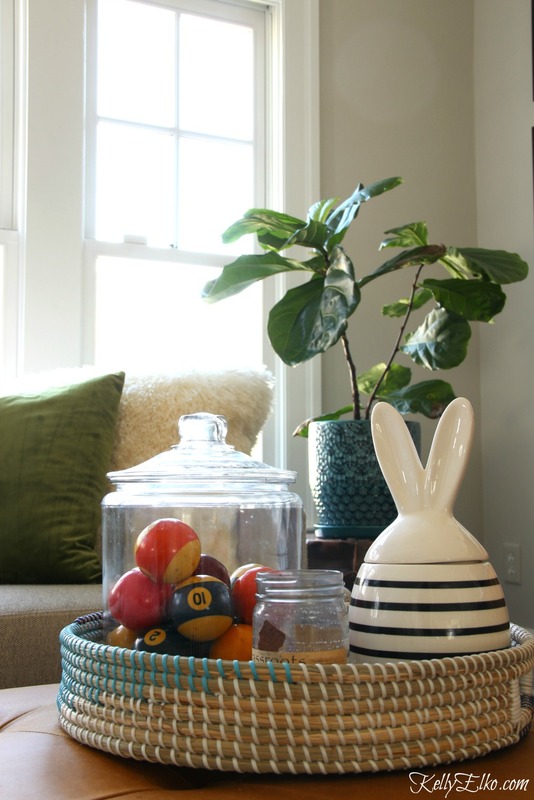 I love the bunny ear jar and the seltzer bottles. The bottles are even Spring colors. Love it all. I adore your vintage touches and what a lovely Spring touch fuchsia is! Woww, nice decoration. I like it.